This review covers two books on iPhone and iOS development: Visual Quickstart Guide: Objective-C by Steven Holzner and iPhone App Development: The Missing Manual by Craig Hockenberry. 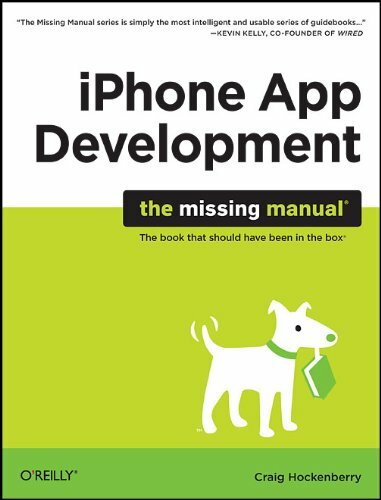 Ironically, the iPhone App Development book was published just after the release of the iPad and nowadays we call this iOS development after the operating system these devices use. This also includes the iPod Touch. Visual Quickstart Guide: Objective-C, like most Visual Quickstart books, offers a solid introduction to the topic and many exercises to get readers familiar with the programming language. Objective-C is the native language for writing iOS applications and for awhile Apple would not accept apps written with other languages and cross-compiled to Objective-C. This has since changed but many developers believe coding with the native language makes for a better application. The Visual Quickstart Guide teaches the basic elements of Objective-C but it doesn’t address every aspect of the language. Readers who are new to object-oriented programming will benefit more from this book, which teaches the concept and its implications in iOS development. Experienced developers who know OOP or similar languages like ActionScript 3 can learn a few things from the book but I think there are better resources out there. The Missing Manual sets itself apart by offering beginning-to-end training for iOS development—everything from installing Xcode to selling apps from the Apple App Store. I really like this aspect of the book, and developers who want to make money with their products will find this very useful. I think there’s less emphasis on Objective-C but part of that is because Craig uses Apple’s developer tools like the Interface Builder to create the applications demonstrated in the book. The obvious downside to this is the fact that Apple’s developer tools are available only on Mac OS X computers—Windows users are out of luck, even though iOS devices are marketed to them too. Both books are good buys, and as with most things each one offers something a little different. Objective-C is a solid introduction to the language and green developer would find it very useful. The Missing Manual is a more complete resource for iOS development and is written for the entrepreneurial developer who wants to sell apps as much as develop them.